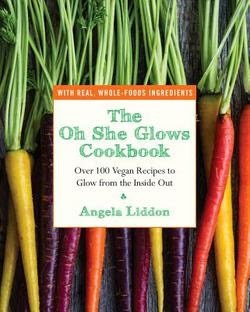 My new favorite cookbook - The Oh She Glows Cookbook - is definitely helping me have 100 happy days. I'll count it today as my Day 14 of #100happydays - but truly, I could count it for just about everyday. The cookbook only came out this month and I had pre-ordered. Its just a lovely book. It is vegan but I think it has an appeal to everyone. The dishes are delish and will suit all palates. First off though, it looks like a "proper" cookbook. So often vegan or plant based cookbooks aren't so appealing in their layout and design but this one is beautiful with gorgeous photos of every dish. I started flipping through the pages and adding stickers to the recipes I wanted to try - but quickly ran out of stickers! It would have been easier to mark the couple that didn't appeal to me! There are more than 100 recipes, 90 of which are gluten free. They are higher in sweeteners and oil than I typically use, but easily adaptable to reducing those levels if you so wish. There are considerations for other food allergies too, with soy free, grain free, and nut free recipes as well. I've really enjoyed cooking from the book. We had friends stay the weekend so I made the ultimate nutty granola clusters and they were a huge hit. and today I'm giving the "present glo bars" a try. I'll let you know how they turn out. I highly recommend this book - for vegans, vegetarians, omnivores or whatever. It'll make you happy. I made a second batch of rosehip truffles as we have friends coming around today. Thursday I posted the recipe - and it was one of the few recipes written by someone else that I didn't tweak and change anything on - as it seemed perfect. 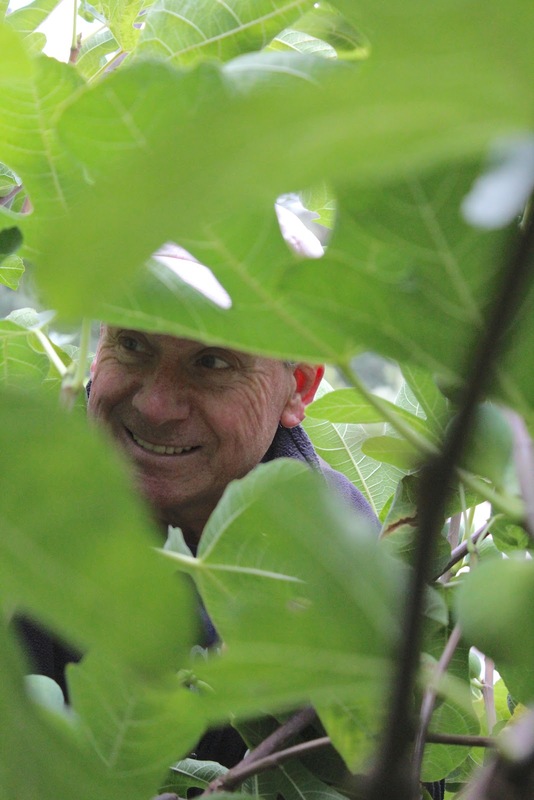 However, today I did do something different and I prefer it - so you may want to give it a try - or not. I still think both versions are great. It was just in the dusting part. Instead of mixing the rosehip powder with cocoa powder and dusting the truffles, I just used the rose hip powder. We don't need chocolate or cocoa to be in all our truffles. I like the idea of these being chocolate free and more fruity and spicy instead. Process the nuts in the food processor to finely chop them. Then add the rest of the ingredients, (except for the dusting rose hip powder). Process for approx 1 minute until it forms into a ball and starts to stick together. We've now harvested the majority of our apples - and I've already dehydrated five large bags of them. They taste yummy dried - with nothing added. And like our pears, our apples are huge this year. We have a few apples that weigh more than a pound each! 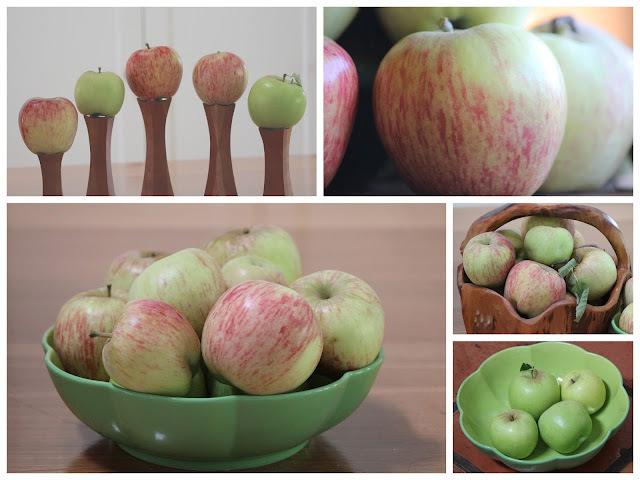 It sort of makes a mockery of the "apple a day keeps the doctor away" as one of our apples could feed a family of four! In fact, it did for lunch today. I made a nice slaw with a single large apple, walnuts, spring onion and mint. And it fed four of us nicely! Not quite sure what has happened with our orchard fruit this year. We've never seen it so large - with pears over a pound each, apples the same and even large nectarines! Yet not a great year for tomatoes. But no complaints! We are loving it. What are you enjoying this early September? We had a great class this morning, focusing on beans, legumes and lentils. All wonderful sources of fiber - not to mention also great source of protein, molybdenum, B vitamins, calcium, anti-oxidants, folic acid...the list goes on. Beans have many health benefits eg in heart disease for reducing homocysteine levels, stabilizing blood sugar levels, anti-inflammatory effects, and from the high fiber content, assisting elimination of excess hormones, cholesterol, toxins and carcinogens. We also discussed ways of cooking, soaking and how to reduce the gas-producing effect of beans by combining with certain spices and herbs or through the cooking and soaking techniques. What a filling lunch that was! I don't think any went home hungry and we got our 35+g of fiber today, just in one meal! 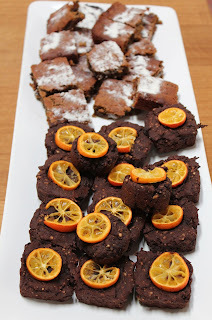 And we restrained from the black bean brownies and not-so-dumb blondies this time! Next time we will be focussing on fats, oils, essential fatty acids and the effects they have on our health. Let me know if you are interested in attending a class. I love my Bamix. I've had one for years - originally had one in England so that must be over 20 years ago. 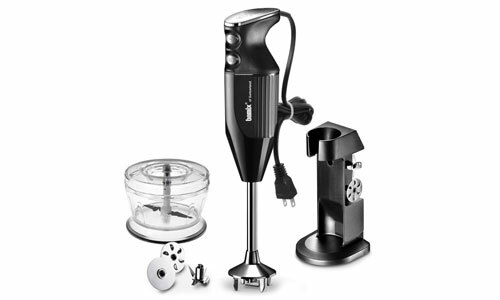 The Bamix is an immersion blender with a small processor/grinder attachment. I actually rarely use it as an immersion blender but use it all the time with the grinder. It gets used a few times every week especially as it is my go to piece of equipment for grinding my flax seeds. I also use it for making nut butters. As the grinder is only a small size, it makes great nut butter. I never want large quantities anyhow so it is perfect. Today and last week I used it for a batch of nutella, as I'm making nutella ice cream for friends this weekend. If I'm making nutella ice cream just for me, I make everything in the grinder - as all it is one tablespoon of healthy nutella plus one frozen banana. Whip them up and you get yummy ice cream. I'll be making enough ice cream for 3 of us so the bamix made the nutella and I'll use my regular processor for the frozen banana bit. I also use the grinder for spices, herbs, nuts, seeds, making bread crumbs, etc. You can use dry and wet ingredients in it. Unlike a coffee grinder, which many makes you can't wash properly, the bamix grinder comes apart for easy cleaning. The immersion blender comes with different blades for doing different things. There is a flat disk useful for whipping and you can whip non dairy milks into the texture of cream with that as its so powerful. Great for fancy coffee drinks if you like those. It is more expensive than other immersion blenders but it is also more powerful and the small size of the grinder is perfect so many things. If the hazelnuts aren't already roasted, dry roast them in a pan and the rub them in a kitchen towel to remove the skins. Place the hazelnuts in the Bamix grinder and grind/blend, stopping frequently to scrape down the sides. It does take a reasonable amount of scraping - and grind for about 5 minutes until the consistency of a nut butter. Add the remaining ingredients to the grinder and whip in the grinder until smooth. To make healthy nutella ice cream, for one person, blend 1 chopped frozen banana with 1 tablespoon of healthy nutella. Enjoy! Easily multiplies up for more people. 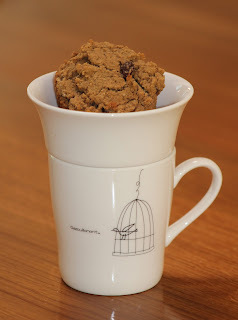 These healthy bran muffins probably took 30 minutes from start to eating! Not bad, I'd say. They were inspired by a box of rice bran I had in the cupboard and that had been in the cupboard quite a while - unopened. I was sitting fancying a sweet-ish snack and the idea of a bran muffin came into my head. Each muffin has more than 6g of fiber in it, is gluten free, dairy free - and there's no added oil. 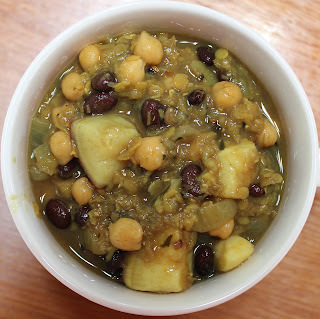 Here's the recipe if you want to make something quick, easy and healthy. 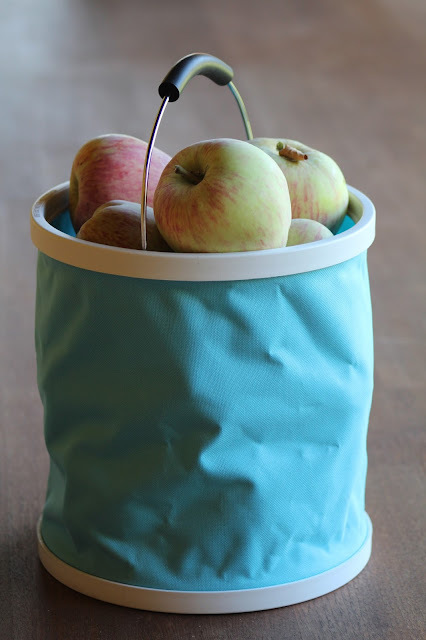 Use a silicone muffin tray or muffin baking papers. In a mixing bowl, mix the bran with flour and baking powder and soda. Add the remaining ingredients and mix to combine. 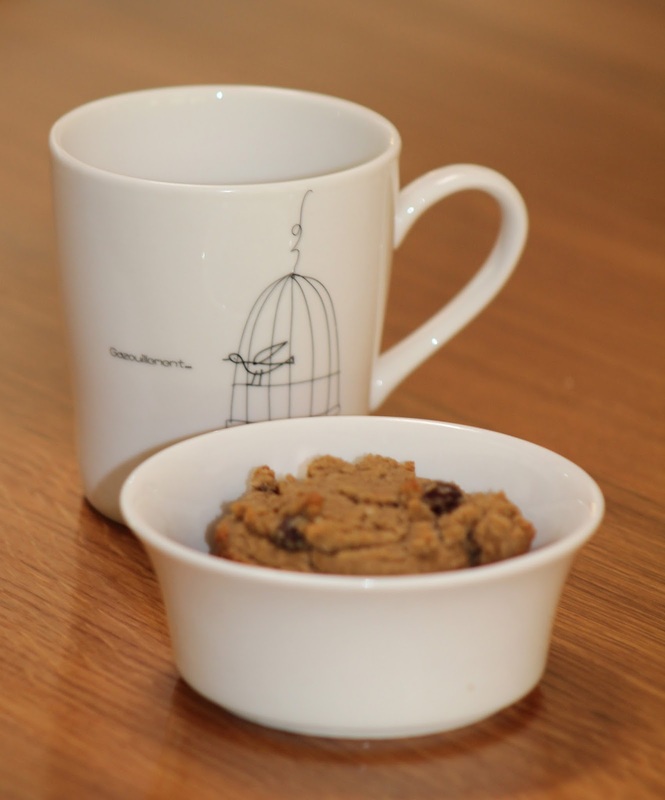 Spoon into the muffin cups and bake for 15 - 20 minutes, until a toothpick insert inside one, comes our clean, or when pressing the top of the muffin, it returns its shape. Cool on a rack - if you aren't tempted to eat them while fresh and warm! The raisins can be omitted or substituted with nuts or other dried fruit. 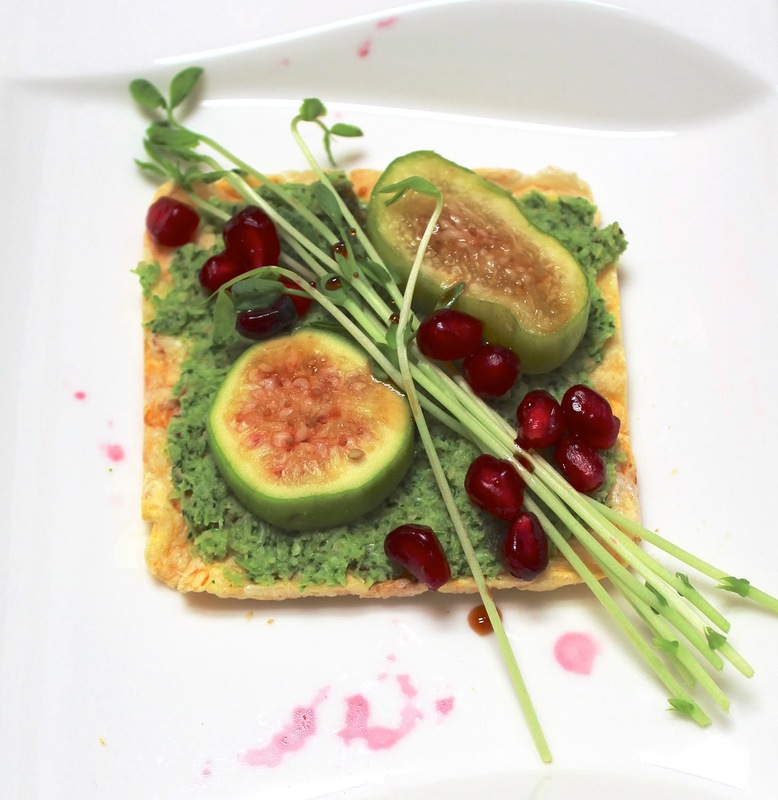 One of the dishes we made in our Food as Medicine classes this week was Fig and Broccoli tartine. Tartine is the French word for open faced sandwich. It sounds so much nicer than just "sandwich". These are lovely - and you can really be creative with your toppings, depending what is in season. I just happened to see some green figs for sale and our fig tree doesn't ripen until the fall, so thought it would be nice to use those - but you could put anything on top of the broccoli. I don't generally eat a lot of broccoli - no specific reason, just that I don't seem to use it much - but this is a great way to serve raw broccoli and get all the benefits of some good cruciferous vegetables. 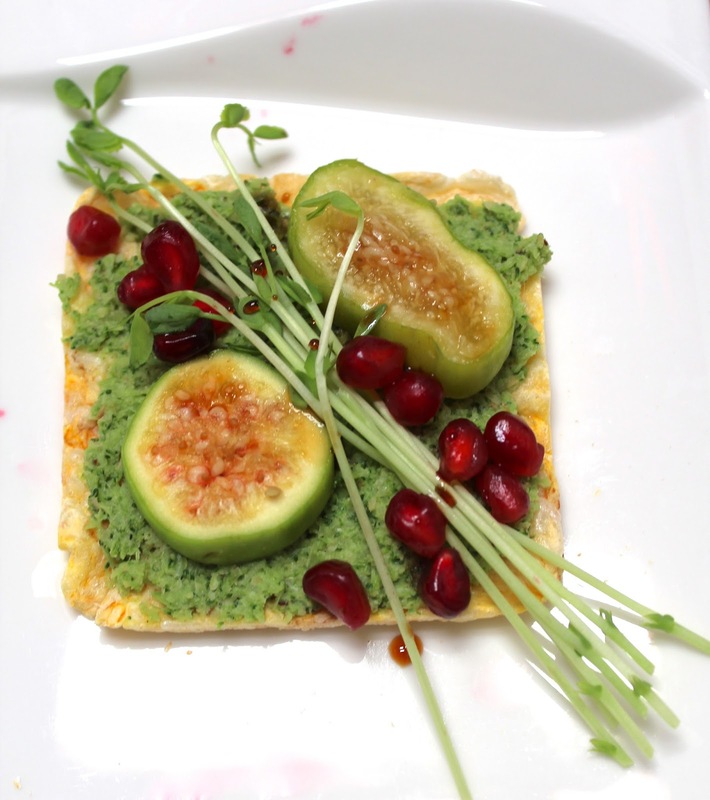 Combine all the ingredients for the broccoli spread in a blender or food processor with half of the water and puree. Add more water as needed until smooth, stopping and scraping down as necessary. Taste and adjust the seasoning. Add more water if it seems dry. Spread the broccoli spread generously on the toast. 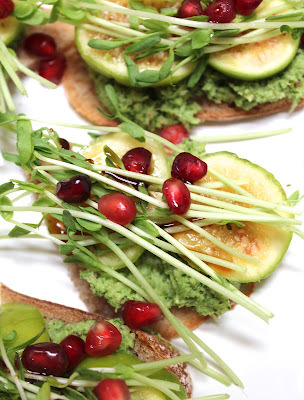 Top with figs, pea shoots, pomegranate seeds and drizzle sparingly with balsamic vinegar or pomegranate molasses. 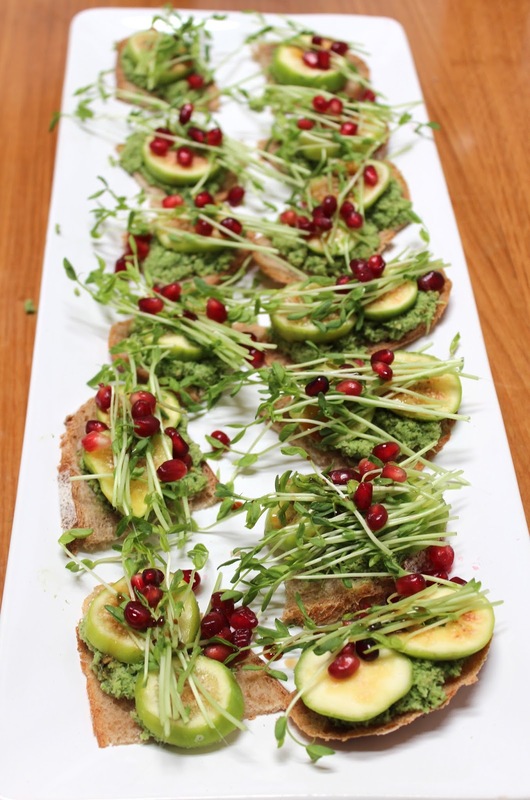 Instead of the pea shoots, you could try leafy sprouts or thinly sliced radish or anything that makes it look pretty! As the bread we used was whole wheat, I made my own gluten free tartine using a square quinoa/rice cake - and it looked just as pretty - maybe even prettier, as you can see in the above 2 photos! Another variation for those with nut allergies is using chickpeas instead of hazelnuts in the broccoli spread. 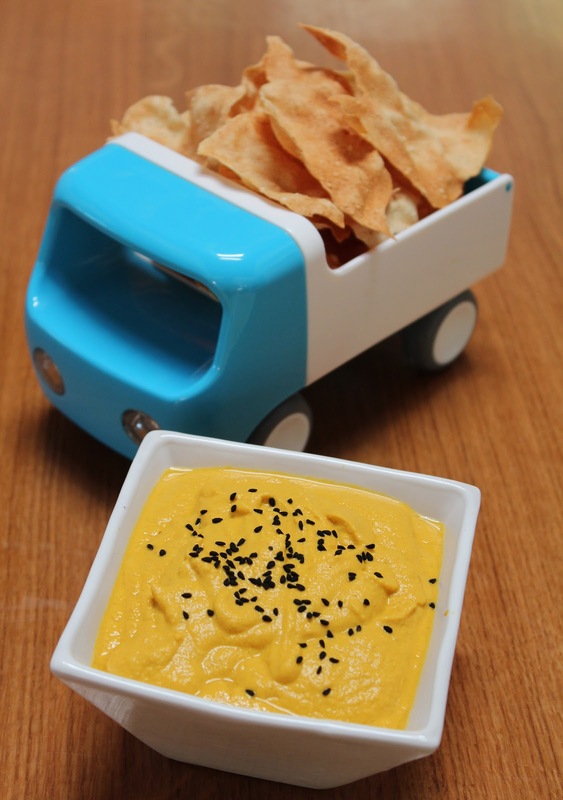 I've made it using one drained can of chickpeas and no nuts. The spread can also be used as a pesto for pasta or vegetables, by adding a little more water to it. 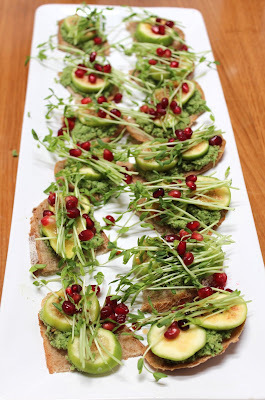 So get your creative hat on and think about some pretty tartines for summer lunches, or even dinners on hot evenings. Yesterday was the final class for my Thursday group. 10 months together. I'll miss them. We had a lovely few hours - covered a lot of things and made some yummy healthy food together. We ate a rainbow - with no added sugar, salt, or oil - and no dairy or gluten either. I'll share some of the recipes soon. The photos are after we'd eaten most of the lunch together with only the sugar free chocolate mousse remaining. Two new classes start in September.....so I only have one group continuing through the summer now. Time to get planning some new things, I think. I never thought I would, but I like chia fresca! 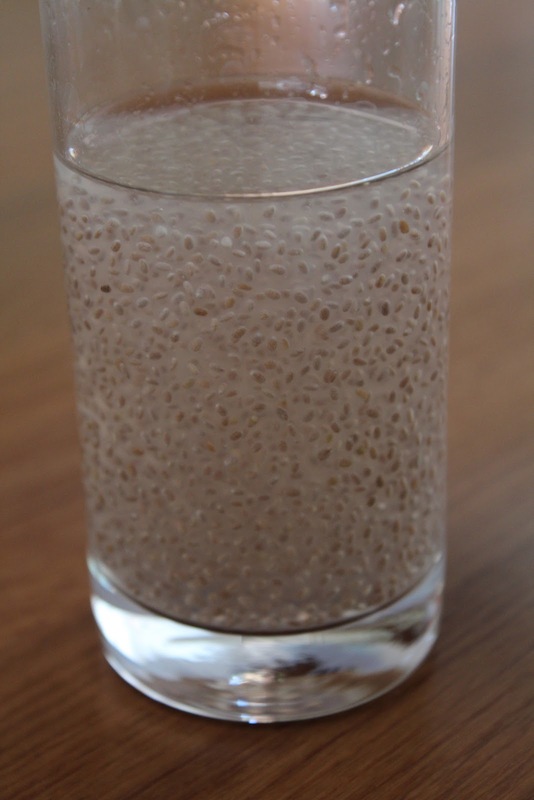 Never being one for tapioca because I always thought it looked like frog spawn, now here I am drinking frog-spawn-looking chia fresca!! Juice of one or two lemons or limes, depending on your taste. 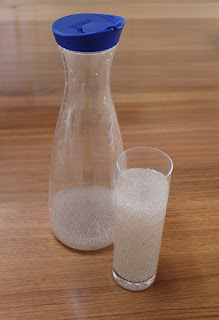 Pour the water into a jug and add the chia seeds, whisking immediately. Leave for 3 - 4 minutes and whisk again. Leave for 10 minutes, whisk again and add the citrus juice. 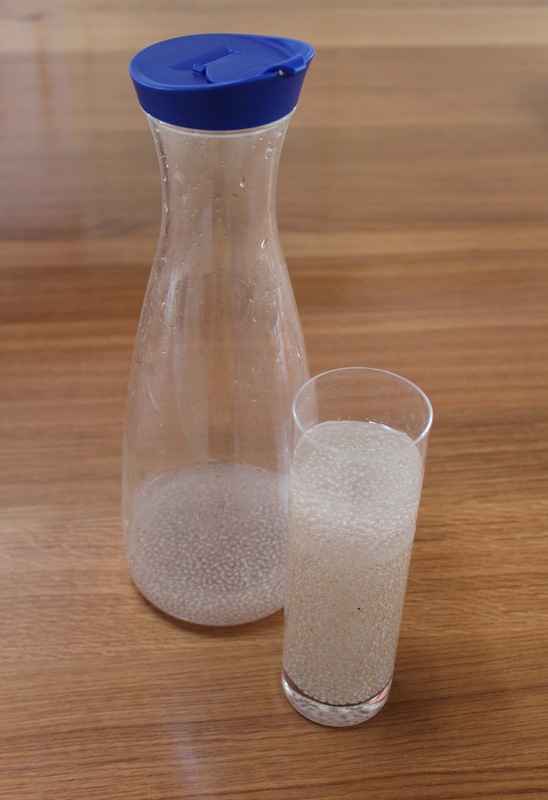 The drink will thicken and become like a gel. Stir before drinking. Don't say you can see the tadpoles starting to swim!! I made some homemade hemp butter this week. I used the little container that comes with my immersion blender and just blended the hemp seeds in that. I've used the same process to make nut butters. After a while, it didn't seem to be creaming into butter, so I added just a few cashews and that got it all going. I like it. It's not too grassy in taste. I say that because I tried making hemp milk the other week and it just tasted really green and grassy. I didn't like it at all. But the butter is quite tasty and a good texture. So - its a simple recipe - bunch of hemp seeds. Whizz and if it doesn't cream, add just a few cashew nuts! Hemp seeds are a great source of both omega 3 and omega 6 fatty acids in a perfect ratio. Rhubarb is one of my favorite fruits vegetables. Yes, it is officially a vegetable, but I still think of it as a fruit. I've been looking for it for the past month, but it seems later than I remember this year. Anyhow - I found some this week and so had to make something with it! 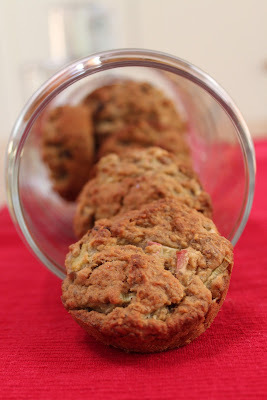 I made some chia rhubarb and ginger muffin tops. Gluten free, dairy free, refined sugar free. The chia seeds add some great omega-3 fats to the muffin too. 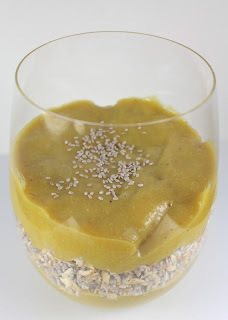 You'll be seeing more chia, flax and hemp recipes and posts here, as my Food as Medicine classes next week are all about essential fatty acids. I made these gluten free, using a GF oat flour, but you could easily substitute for a whole grain flour with gluten, such as spelt or wheat or..... They will probably rise a little more with a flour with gluten too, so if you try them, send me a photo. In a large mixing bowl, combine the flour, oats, baking powder, baking soda and spices and mix. 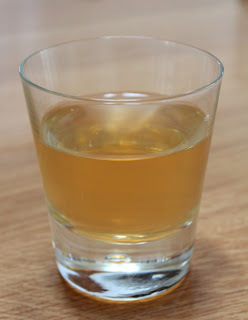 In a smaller separate bowl, combine the oil, coconut nectar, orange juice and vanilla extract. Add the thickened chia seed mix and whisk until smooth. Add the wet ingredients to the dry ingredients and stir until just combined. Add the rhubarb and raisins and stir thoroughly. Spoon the batter into 12 muffin cups. If using, sprinkle the topping on each muffin. Bake for 25 - 30 minutes until springy to the touch. Cool. I make a big bowl of coleslaw at least once a week. It's a great way to enjoy cabbage - a cruciferous vegetable and an easy way to add whatever else you have in the fridge. Today, I made a different style of dressing for it - a mustard dressing. It gives it a "meaty" sort of flavor. I always think the taste of mustard is suggestive of meat. When I make my lentil pate, it always tastes like it isn't vegan, because of the mustard. It's a great snack, side dish, salad....and lasts a few days in the fridge. Unlike most coleslaws, it isn't made with mayonnaise or heavy in fat or dairy products. What are your staples in coleslaw? I'm back from vacation. Had a lovely time. Quite different - no roads or cars, only burros and boats - so that meant for lots of walking! I am then taking the groups on a tour of Whole Foods to learn about reading food labels and the best food brands to buy. Sounds like a busy and fun time! I'll let you know how it goes and try to remember to take my camera! 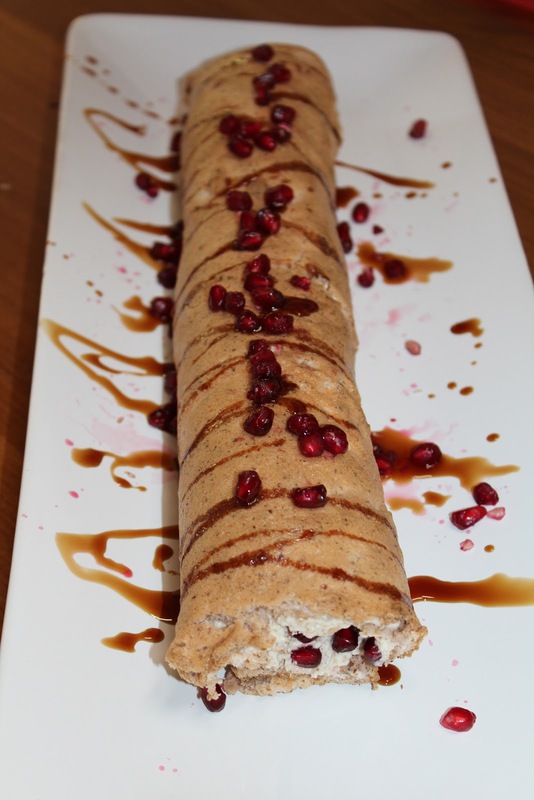 I'm in love with this new dish, made from whole oat kernels, also known as oat groats or oat berries. It's one of those dishes where you make enough to last you a few days and then add different things to it each time you eat to. My latest addition was my mandarinquats from the garden, with some kale, also from the garden and drizzled with pomegranate molasses! Pomegranates are so beautiful - just like jewels. I think they make most dishes look beautiful. 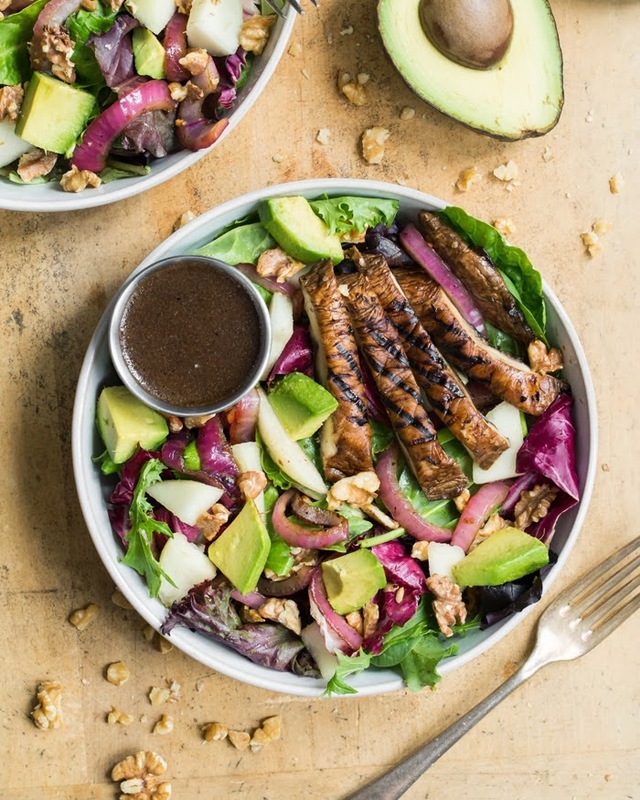 This is a great healthy dish, full of fiber and nutrients with no added oil. 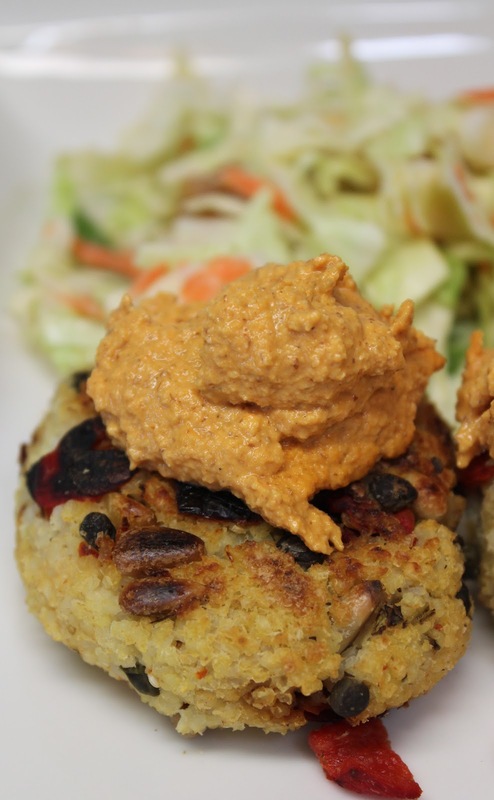 Have you tried cooking with whole oat kernels before? For Christmas Day, I made myself a spice cake instead of having a rich Christmas pudding or cake. I've made it since too - as I really like the recipe. It's only small so you don't end up eating it every day for a week as desserts are meant to be treats! It's gluten free (using GF oat flour), has no refined sugar (using low glycemic load coconut nectar instead), fat free (using applesauce instead), dairy free (using homemade almond milk instead) and full of lovely anti-oxidant spices. I made it in a small half dome cake tin - so it looked a little like an English Christmas pudding. You can, of course, add frosting/icing - but I like the spices so don't add anything. If you don't have a half dome tin, bake it in muffin tins or a small square tin. 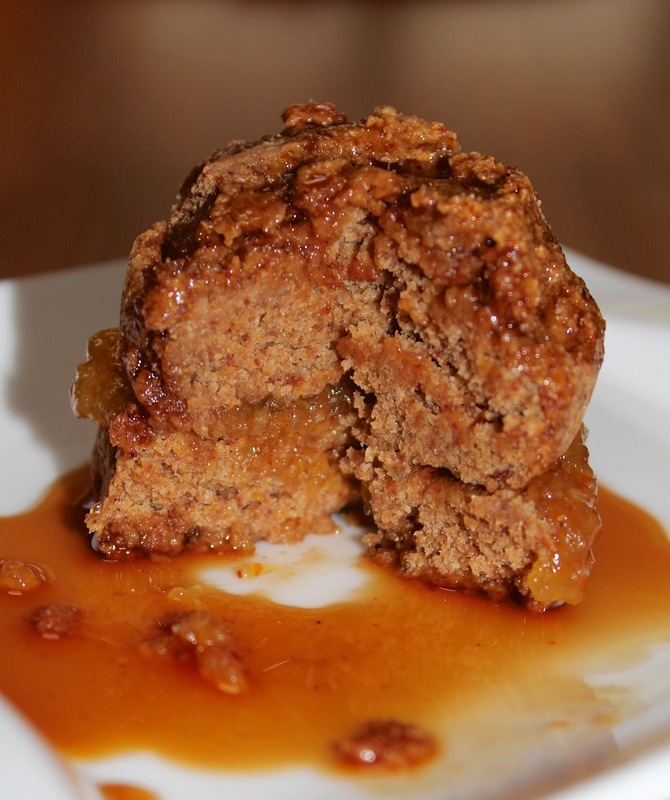 It was adapted from Chocolate Covered Katie's recipe for Egg Nog Spice cake. Combine all the dry ingredients together in a bowl. Mix well. In a separate bowl, mix the wet ingredients, then pour the dry into the wet. Stir until just combined, then pour in your selected baking tin. Cook at 350 F for 20 - 25 minutes, depending on the tin. Remove, let cool if you can - and enjoy. You'll also enjoy the lovely smell it gives to your home. I've been making raw chocolate today. Yes, chocolate that has health benefits and is refined sugar free, dairy free and gluten free! The recipe needs a little tweaking still, but the taste is wonderful. I don't think reworking the recipe will be too much of a hardship! You may recall at the gluten free, dairy free, refined sugar free dessert class I taught a couple of months ago, I did dried strawberry and pink peppercorn cookies. I just love the combination so tried that as one of my raw chocolate flavors. It is yummy. I used coconut nectar as the sweetener and it didn't combine completely with the chocolate so I'll try reducing it a little next time....maybe tomorrow! I love this new mold I bought in England. It make a perfect sized bite...4cm x 2.5 cm. And the chocolate tempered well, with a lovely glossy sheen. Picking a fresh fig from our tree, when it is gently warmed by the sun is just heaven! The figs are soft, with such jammy red sweet interiors. I could - and do eat them all day! 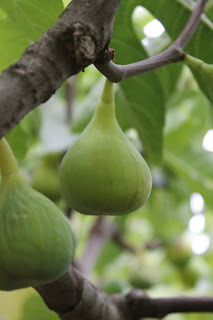 I'm not a fan of dried figs so when the fruit is ripe, we need to eat it up! 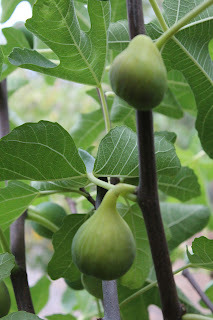 I've made fig and ginger jam, fig chutney and other preserves in the past and think I'll have to start on some soon with this years crop, but for now we are just enjoying them - and giving plenty away for friends. My morning cereal- yes there is a little cereal under those figs! What was the tastiest thing you ate this week? Our quince tree has grown a lot this year and has many large quince on it. Quince is not a fruit that you eat raw so I've been wondering what to do with all these fruit. There must be at least a hundred quince on the tree! In previous years I've used the few fruits we got in salads, an upside quince cake, making quince jelly etc. When you search for quince recipes however, they all tend to involve large amounts of added sugar. I wanted to avoid this. Also, quince are not easy to cut and prepare as they are very hard when raw. So, I decided I would just peel them and then cook them in the simmering oven of my aga in water. They came out beautifully. As they are so large, I could only cook 6 at a time, so did three batches today! I guess that means I have about 6 days of cooking in total! After cooking them, I then made them into quincesauce - which is really just like applesauce, but made with quince instead of apples! I don't add any sweetener at all - and it really doesn't need it. Basically it is pureed cooked quince and delicious. I love the fact that its not too sweet and can see myself using it in a lot of different dishes. I used some to make a quince fool today and then made a big batch of quince granola - basically gluten free oats, puffed brown rice and quinoa flakes tossed in quince sauce and baked. I think I will easily have enough quince sauce to last me the year, that is if I get around to cooking the rest of the quince! Wish me luck or maybe it's stamina I need! Quince have high levels of fiber, are high in antioxidants and contain a lot of pectin. They also help with digestion and relieve diarrhea and have been seen to have anti-viral effects. I seem to have spent the last couple of days with my hands in sticky fruit juice! What with pulling each little seedless green grape off his stalk to dehydrate them to make golden raisins/sultanas, and with chopping the cherry tomatoes and apples, it's been sticky, sticky, sticky! I'm delighted with the sultanas/golden raisins. They don't look particularly golden - but they are! Sultanas/golden raisins are green grapes, and raisins are red grapes. When you buy golden raisins, they are often a paler color because of the addition of sulphites, which of course I didn't add. But pulling all the grapes off the stems was a little tedious! I tried dehydrating some of them in little bunches as I thought they would be useful decoratively on dishes..... Surprisingly, those in bunches seem to dry out quicker than individual grapes. I don't quite understand that as you'd think there would be more air flow around individual grapes????? After about 9 trays, I had had enough of de-stemming and juiced the rest. The juice is so grapey! No surprise really, but it tastes different than other grape juice - because it's a different grape varietal than is used commercially. It's not too sweet...but it is bordering on the sweet side! It came out lovely and clear however. Happy grape successes! Now onto tomatoes and apples.....before the pears start ripening! We harvested our table grapes today from our arbor. They are lovely sweet seedless grapes. 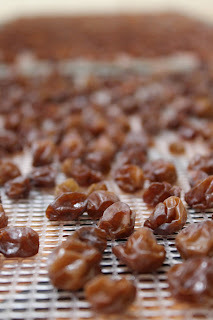 Most of them I am going to dehydrate to make sultanas - or golden raisins as they are called here in the US. I still prefer to call them sultanas. 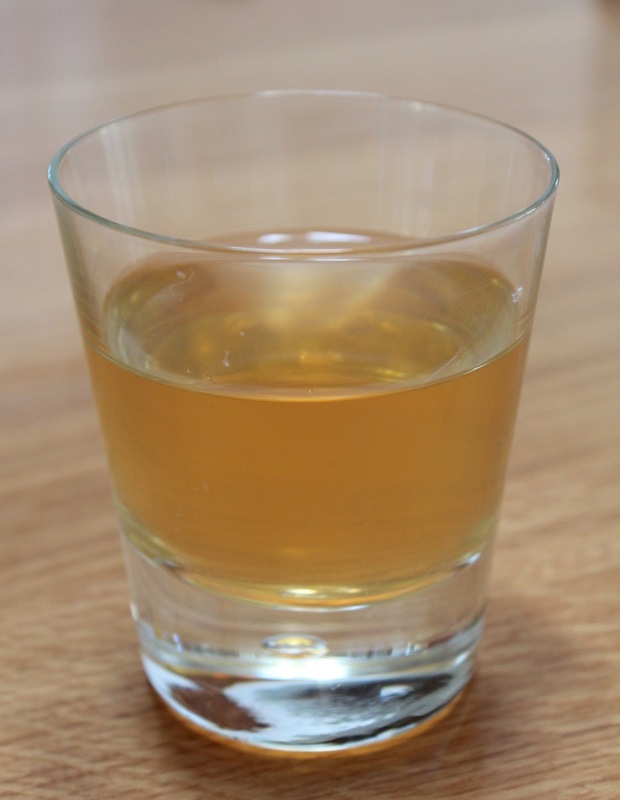 Of course, we don't use sulphur on ours as a preservative, like many store-bought golden raisins. Ours tend to come out a little darker in color than the ones we used to buy in England... I suspect it is because it is a different grape varietal. But I use a lot of them....in baking, for snacking and daily on my unsweetened cereal or oatmeal. The first three trays are in the dehydrator now. I still have loads more bunches to de-stem but that is enough for one day! My hands still feel sticky from all that sweet juice, even after washing them a couple of times! Sultanas are high in anti-oxidant levels and despite being high in sugar, they don't cause spikes in your blood sugar levels like refined sugar does, because they are a whole food, with plenty of fiber. They also contain iron, calcium, protein and vitamin C. A phytonutrient called oleanolic acid in sultanas helps promote good oral health by destroying the bacteria that cause cavities. 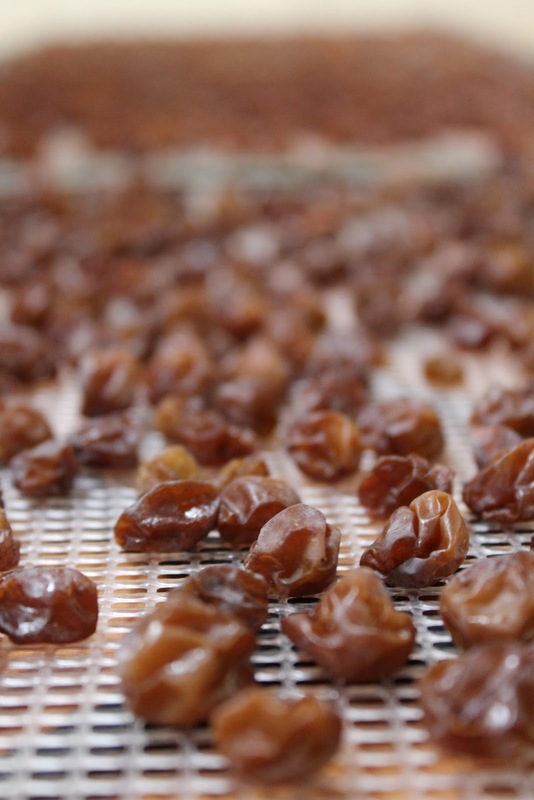 Just as you can use dates in baking and cooking to replace refined sugar, you can similarly use sultanas and raisins. Before using them, you should rehydrate them by soaking them in water for 10 - 15 minutes and then drinking them. Look at this salad! Isn't it just a feast for the eyes with all these colors? The prize ingredient is Chioggia beets. I only heard about them recently so bought one to try in my salad. You just eat it raw, thinly sliced and it puts a big smile on your face because it looks so happy there on the plate or in the bowl! I remember being excited the first time I saw golden beets -but now, they seem positively boring compared to Chioggias! The Chioggia beet came from an Italian coastal town called Chioggia (! ), near Venice. The beet has been around since the early 19th century and tastes a little sweeter than a red beet. As well as looking great, beets have lots of fiber, potassium, iron, folic acid and B vitamins. The pigment that gives them their great color is called Betacyanin and is a powerful antioxidant. Obviously, as well as slicing them raw in salads, you can sauté them with greens, roast them, pickle them, add them to soups etc etc, however the stripes fade a little with cooking. I've been experimenting in the kitchen today and it still continues. Here is one of the results - a raspberry macaron (and yes, I did make more than one!!). Macarons, if you didn't know, are the light fluffy meringue melt-in-your-mouth confectionery, originally from France. Macarons are naturally gluten free as they use almond flour instead of a gluten flour. The exciting part about todays experiment's, for me at least, is that I made flour from fruit and used it in the macaron, replacing some of the almond flour. The flour I made was from raspberries. How cool is that - and so the little meringues taste of raspberries! With all these alternative flours out there, I thought I'd try making some for myself and this is my first attempt. I wonder what will come next????? The theme of macarons is continuing in this kitchen, as I'm trying out a sugar free version. They are just drying now. If they are successful, you'll see them soon! 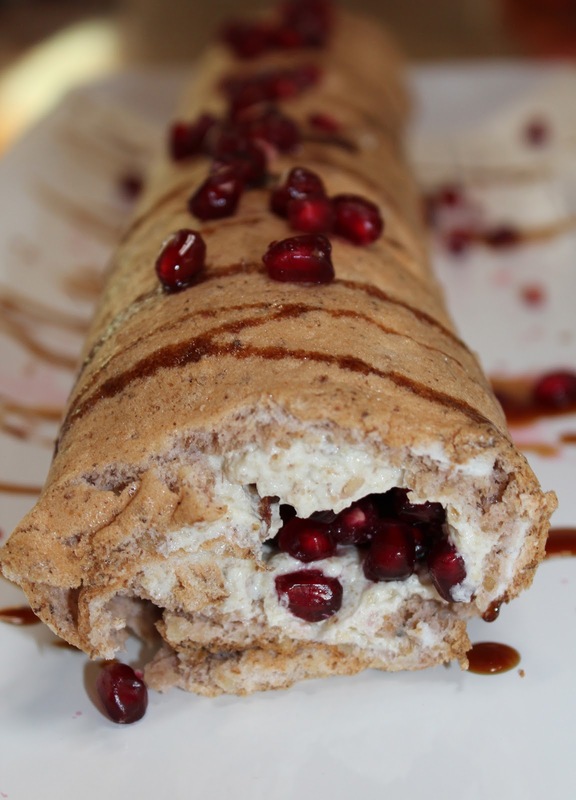 Have you ever tried using/making fruit flour? If you are giving up dairy, here's an easy way to make your own non-dairy milk using oats. In this case, I used gluten free oats. 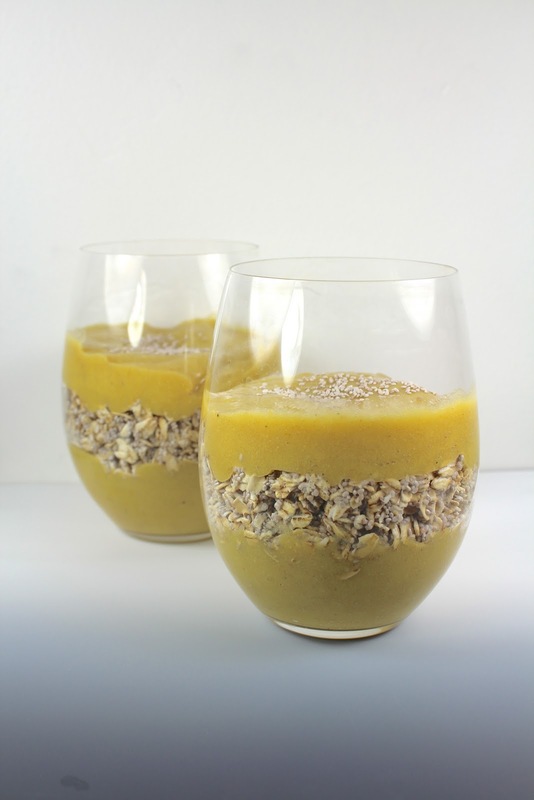 Soak one cup of oats in water overnight. Pour enough water to cover the oats. The oats will swell up to at least 1 1/2 cups. After soaking, drain and rinse the oats. 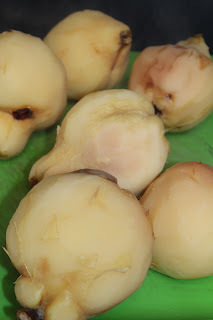 Place them in a blender with 3 cups of water and blend for a minute or so. I used my vitamix so it was very quick. For less powerful models, you may need to blend for a couple of minutes. Pour the milk into a nut bag and collect the yummy healthy milk. You will get about 4 cups of oat milk. Keep this in the fridge and use it within a week, on your morning cereal and in cooking. It is versatile as the oats don't give a strong overpowering flavor. Here is a photo of this morning's breakfast - my puffed brown rice cereal, with raspberries, bananas and home made gluten free oat milk. 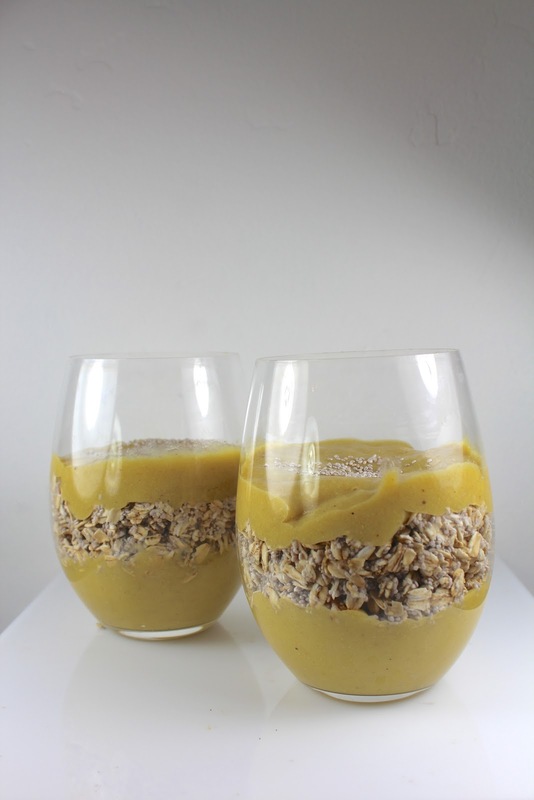 If you prefer a thicker, creamier consistency, just reduce the amount of water your add to the blender. I'll be back with other non dairy milk recipes soon. Hope you give it a try. I hope you'll enjoy the following recipe. It is to create a healthy low fat, low sugar, gluten free granola. The recipe shows you how to create a plain granola and then each morning you can add additional fresh ingredients such as fruit, nuts, seeds, etc to create the taste you desire at that time. 2. Mix the oats and rice together and stir in the apple sauce, to thoroughly combine. 3. Spread on a baking sheet and bake for 10 minutes. 5. Return to the oven for another 10 minutes. If it is dry and crispy, remove. If still a bit soft, stir and put back in for a couple more minutes. Watch it carefully as the edges may burn. 6. Cool and store in a jar for a month. It isn't sweet but the addition of fruit sweetens it enough for me. If you prefer, you could add some stevia as sweetener. My favorite way to eat this is with raspberries and blackberries and a little unsweetened almond milk. It has a much lower fat and sugar content than granolas you buy - check the labels. Instead of wearing green today, for St Patrick's day, why not eat green instead! There are so many yummy green vegetables out there - gorgeous, vibrant colors, packed with vitamins, phytochemicals, enzymes, minerals etc. So make a point today to add green to your diet instead of or as well as your attire!